This is a tutorial on how to install and set up backtrack 4 beta using vmware. type in "/etc/init.d/networking start" before typing in "startx"
More info & download VLC Media Player. Use Google operators to find unprotected directories of audio files or files of type .mp3. -inurl:(htm|html|php) intitle:"index of" +"last modified" +"parent directory" +description +size +(wma|mp3) "Nickelback"
This will turn up several directory listings of Nickelback MP3's. Replace "Nickelback" with the artist, genre or keyword of your liking. Note: this is not intended to be used to download mp3's illegally. -A - allows you to specify which types of accepted files should be downloaded. In this case, all files with the .wma and .mp3 file extension will be downloaded. The hibernate feature allows operating system to save and write the running state and contents of RAM as a file (c:\hiberfil.sys) or partition to non-volatile storage such as a hard disk, before powering off the computer. Hibernation allows system to quickly restart and restore to the previous state when hibernation was invoked, instead of having to shut down, then restart applications. In Windows 7, the hibernate option should be enabled by default, However, if you can’t find Hibernate option in the Start menu / power button, it can easily be enabled. This works in Windows Vista, Windows 2008, 2003, etc. Open an elevated Command Prompt with administrator rights by typing cmd in Start / Search, and then hit Ctrl + Shift + Enter keyboard shortcut. Or, select Run as Administrator from the cmd in search results or Start, Programs, Accessories, cmd. The hibernate option should now be available in the Start menu, power button. Note: Windows does not support hibernation on system with 4GB or more RAM memory. UPDATE (12-2016): See HowTo: Install AWS CLI on Both Windows and Linux for updated information on installing, configuring and using the AWS CLI unified tools. NOTE: This tutorial contains information for both AMI and API command line tools along with ELB tools. Most users will need the API tools, some the ELB tools, and not many will need the AMI tools. There are a number of GUI tools for working with Amazon EC2 services such as ElasticFox, RightScale and AWS Management Console. However often you need to use the command line tools because you want to script a task, or access features that a GUI tool doesn’t provide. There are several guides and tutorials on installing and configuring the command line tools on Linux, but not much for Windows. 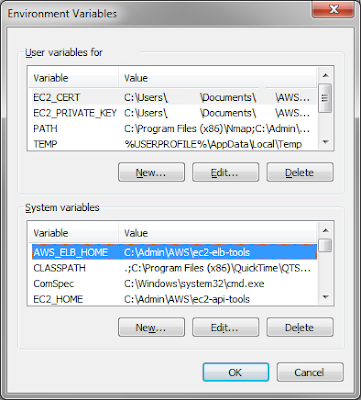 So this aims to be THE GUIDE to setting up the EC2 API, ELB and EC2 AMI command line tools on Windows. The first requirement is to have Java 5 or later installed. If you don’t already have it download and install from here. I like to organize my programs a certain way so I installed the tools to c:\admin\aws. You can install the tools wherever you like. Note, this is where you may store your certificates, the services API files, etc. Alternatively you could download one or both directly from your browser. EC2 API Tools. ELB Tools. EC2 AMI Tools. Authentication to AWS uses a certificate and private key. You will have to retrieve these files from AWS. Logon to the AWS Console and scroll down to the X.509 area. You may have to create a new certificate. 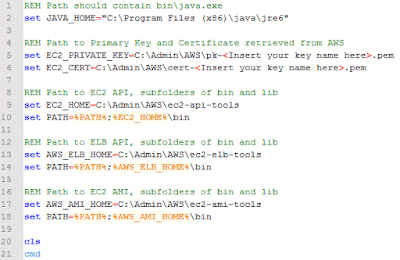 Once you do Amazon will provide you a Private Key File (pk-.pem) and a Certificate (cert-.pem). KEEP THESE FILES PRIVATE. Possession of these two files give you (or anyone else with them) access to your AWS account. You need to configure your command line environment with a few environment variables. This method is used to launch a command prompt with required settings. These settings are available only for this session. If you'd like to configure your system to have these settings available always and system-wide use method 2. Note: Make sure none of the path statements in this file end with a trailing slash. This method adds the necessary system variables to either your profile or system-wide and makes them available anytime you launch a command prompt. Open the environment variables dialogue (right-click on My Computer, select System Properties, click Advanced tab, then Environment Variables button). Add the following to either your user account or system variables section depending on your needs. JAVA_HOME needs to be set to the appropriate path for your machine. EC2_Private_Key and EC2_Cert both are the location of the private key and certificate that you retrieved from the AWS website in the previous step. You could rename the key and certificate for simplification. If you have multiple AWS accounts all you need to do is modify these lines to switch between accounts. If you receive an error running this command then you need to go back and verify your installation. UPDATE: Recently I had to change my Amazon access credentials and created a new X.509 certificate. When I tried to run any commands from the command line I received the message, "Client.AuthFailure: AWS was not able to validate the provided access credentials." So I just downloaded my new Private Key File (pk-.pem) and Certificate (cert-.pem) file replacing my existing ones, and, viola, I was back in action. Amazon EC2 Now Offers Windows Server 2008 - Finally! Having the context menu option, “Open with Notepad++” (my favorite FREE Windows text editor) is invaluable, making it easy to quickly and easily open files with just a (right) mouse click or two. This registry hack is nothing new, it’s been around forever… think of this as a refresher course. Also note that you can use this same technique to substitute any other application that you’d like by adjusting the path in the registry to point to the different editor or to add other "open with" Context Menu options. Right-click on “shell” and choose to create a new key, calling it “Open with Notepad++”. Create a new key below that one called “command”. NOTE: your path may be different. The change should take effect immediately. Now you can right-click on any file and you’ll see the new "Open With Notepad++" menu entry. Just copy the following and save it to a file with a .reg extension. Double-click the file and import to your registry. NOTE: This will work on previous Windows versions as well - Vista, Windows 2008, Windows 2003, etc. Within a couple hours of Amazon's announcement of the availability of Windows 2008 machine images (AMI's) on their EC2 (Elastic Compute Cloud) platform a few days ago I had to give it a try - see my previous post, "Amazon EC2 Now Offers Windows Server 2008 - Finally!" I used RightScale to locate and launch a Windows 2008 instance. Once it was up and running I got the administrator password in ElasticFox, launched RD & went to work checking it out and setting it up to suit my needs. I knew the 10GB "C" drive partition Windows 2003 instances have wouldn't be big enough for Windows 2008 so I started there. I was pleasantly surprised to see a 30GB partition, however that's all, it didn't have a "D" drive like with other instances (both Linux and Windows 2003 have a 340GB partition, at least on m1.small instances, larger instances have larger data drives). Needless to say I was a little disappointed the Windows 2008 instance didn't have an additional drive for data. Guess I'll just have to use EBS (Elastic Block Storage) volume(s). Looks like the Windows 2008 instances are priced the same as the Windows 2003 instances, albeit a with a little disk space - probably have to squeeze a little more $$$ out of us to pay the mighty Microsoft. When you break it down it could actually cost you quite a bit more for Windows 2008 than 2003. Windows 2003 small instance: 720 hour/mo. * $.12 = $86.40 per month. Windows 2008 small instance: 720 hour/mo. * $.12 = $86.40 per month + $36 (to make up for the lost disk space) = $122.40 per month, or 30% more. Of course I had to check the Windows Update status & found it needed 14 "recommended" or critical updates, which I promptly installed. Probably 1/2 of these were release two days ago by Microsoft on Patch Tuesday. But even still I hoped the image would have been a little more up-to-date. While the updates were downloading and installing I tweaked my desktop a little so it would be setup the way I like. 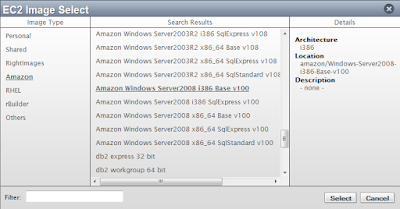 Another feature Amazon announced recently, "Booting From Amazon EBS," is being used by the Windows 2008 instances. This is what enables the larger system partition, or "C" drive. This also enables the ability to "shutdown" the instance, then you can start it back up at a later time & it will pick up where it left off. While the machine is shutdown you won't be charged for computing resources time, but you will still be charged for the EBS volume(s) on which the server is based. One common use case is the desire to make a point‐in‐time copy of the contents of the root device so that another instance could boot off of that image. Images are typically created for backup purposes or to make clones of the existing instance. Previously, this process on Linux required you to create an image of your instance on the instance itself and no APIs were available to assist. On Windows, there was an API that you could call to create an image of the instance, but had to make another subsequent call to register the AMI. Now, there is one API for both Linux/UNIX and Windows that allows you to bundle your AMI backed by Amazon EBS and register it. After setting up and playing with my new EC2 Windows 2008 server for a while I shut it down so I could start it up in the future when I'm ready to dive a little deeper into it. Right now it's costing me $3 a month to sit there - not bad. All in all I'm glad Amazon finally supports Windows 2008 & it seems to function just fine. My existing tools, from ElasticFox, to RightScale, to Amazon Command Line Tools, all work with Windows 2008 without any upgrade or modification, which is a definite plus. I was a little disappointed my small instance has 320GB less storage than a small Linux or Windows 2003 instance, which means I'll have to pay $32/mo. more to get that back - the more I think about it I'm a lot disappointed about the hidden price increase. This method only works for directly linking to YouTube videos. But, what if you want to start an embeded YouTube video at a certain point? That's simple as well. First, grab the video embed code after specifying your desired settings. Don't believe me? Just click the embeded video below and see for yourself. "Well that's just great!" By Nikki of Nikki and Jon, AKA Pranksters In Love. "Evolution of Dance." One of the most popular YouTube videos ever. Today I ran across three useful online tools to do a quick test from multiple locations worldwide of ping, traceroute and DNS lookup. just-ping.com - Online web-based ping: remote ping a server or web site using our network with 40 checkpoints worldwide. just-traceroute.com - Online traceroute from 4 locations worldwide. just-dnslookup.com - Remote DNS lookup (nslookup/dig) from 30+ locations worldwide. Here is a great CDN comparison of performance (latency) from Mudy's Blog. Visit the original post for more information and supporting documentation. Comparison of CDN's (Akami, Limelicht and SAVVIS) used by Amazon.com, Yahoo.com, Wikipedia.org, MySpace.com, MSN.com, Google.com, CNN.com, eBay.com, AOL.com and YouTube.com. BackTrack 3 CDROM, BackTrack 4 DVD or an additional USB thumbdrive (minimum 2GB) – Used to partition the thumbdrive. This tutorial is based commands executed from BackTrack, so you will have to boot BackTrack 4 first. The easiest way to do this is to boot from the BackTrack 4 DVD, which is a live CD. Below are the steps to take to get the drive partitioned and formatted, and were taken from this video on the Offensive Security website. A ‘#‘ indicates a comment and is not part of the command and user typed commands are blue bold. Note, make sure to delete any existing partitions on the drive first. # delete existing partitions, of which there may be more than one. You must include the -L casper-rw portion of the command. Being able to use ext3 is great because of journaling. The -L casper-rw option helps to get around the problem where we had to enter the partition name in order to get persistence working. Partition and format the drive according the layout above. Now you have a bootable BackTrack 4 USB thumb drive. Next let's configure persistent changes. Reboot and either select “Start Persistent Live CD” or just wait since we set it to auto-boot to persistent mode. To testit, create a file and reboot again. If your file is still there, everything is working. Download the Ubuntu Nessus and NessusClient packages from nessus.org. Again, with BackTrack 4 things are little easier. To install the Nessus server, simply execute the following command to install the package. Finally it’s time to configure Nessus. Execute each of the following and follow the prompts. anybody (everything stays local), but anyone with the ability to connect to your Nessus daemon will be able to retrieve this information. server is listening on port 1241. Time to find those vulnerabilities. Since BackTrack will be used to poke at peoples networks and systems, with permission of course, it is very important that the information we find be protected. To do this, we are going to setup an encrypted volume that will eventually become our home directory. Launch truecrypt from a terminal window. When truecrypt opens click the "Create Volume" button. In the Volume Location field enter the path to your volume, like /work_dir, click next. Leave the default Encryption Options & click next. Enter the volume size, say 1GB or so. Select ext3 for the file system type, click next. Click next on the Cross-Platform Support page leaving the default values. Click format - you should move your mouse to create randomness for higher security. You will get a message that the volume was successful created. Click on the ‘OK’ button, then exit the Truecrypt gui, both the ‘Create Volume’ windows and the main windows, going back to your terminal (command line) window. disable later if necessary. All you have to do is execute the following command. That’s it. Now you have the Perfect Backtrack 4 USB Thumb Drive. Name it as desired and change the icon if you'd like. Then you can copy or move it anywhere you'd like - to the Quick Launch toolbar for example. Note: to view a list of Windows icons enter shell32.dll in the "Look for icons in this file" field of the "Change Icon" dialog box of the shortcut properties. Kon-Boot is an prototype piece of software which allows to change contents of a linux kernel (and now Windows kernel also!!!) on the fly (while booting). In the current compilation state it allows to log into a linux system as 'root' user without typing the correct password or to elevate privileges from current user to root. For Windows systems it allows to enter any password protected profile without any knowledge of the password. It was acctually started as silly project of mine, which was born from my never-ending memory problems :) Secondly it was mainly created for Ubuntu, later i have made few add-ons to cover some other linux distributions. Finally, please consider this is my first linux project so far :) Entire Kon-Boot was written in pure x86 assembly, using old grandpa-geezer TASM 4.0. Kon-Boot was designed to work on X86-32 architectures only. This utility was not designed to work with USB sticks, however you can try some unofficial methods to boot Kon-Boot from USB, check the USB tutorial on IronGeek or Raymond blog post. Aircrack-ng is an 802.11 WEP and WPA-PSK keys cracking program that can recover keys once enough data packets have been captured. It implements the standard FMS attack along with some optimizations like KoreK attacks, as well as the all-new PTW attack, thus making the attack much faster compared to other WEP cracking tools. Aircrack-ng is a set of tools for auditing wireless networks - not for WiFi hacking. Make sure you use this on your own network or one where you have permission to test. * Make sure the 'N' and 'M' in NetworkManager are capitalized. Now you should have network connectivity with your desired static IP address in BackTrack 4. While Windows 7 (and Vista, if I remember right) does have a "Show Desktop" shortcut - it's in the system tray, to the right of the clock - you may long for the days when it was in the Quick Launch toolbar like in XP or Windows 2003. Not to fear. You can easily create a show desktop shortcut and place it anywhere you'd like. Save the file as 'Show Desktop.scf' and make sure theat 'All Files' is selected in the File Type list. Save this file on your desktop, then drag it to the Quick Launch toolbar. See also Create Windows Shortcuts With a Script at the Command Line. The only way to ensure that deleted files, as well as files that you encrypt with EFS, are safe from recovery is to use a secure delete application. Secure delete applications overwrite a deleted file's on-disk data using techiques that are shown to make disk data unrecoverable, even using recovery technology that can read patterns in magnetic media that reveal weakly deleted files. SDelete (Secure Delete) is such an application. You can use SDelete both to securely delete existing files, as well as to securely erase any file data that exists in the unallocated portions of a disk (including files that you have already deleted or encrypted). SDelete implements the Department of Defense clearing and sanitizing standard DOD 5220.22-M, to give you confidence that once deleted with SDelete, your file data is gone forever. Note that SDelete securely deletes file data, but not file names located in free disk space. Zero free space (good for virtual disk optimization). Specifies number of overwrite passes. Of course, I had to give it a try. I accessed my account with Elasticfox and browsed through the images, but didn't immediately find a Windows 2008 image, so I headed over to RightScale, found what I was looking for and immediately launched an instance. I launched it through RightScale (which I do sometimes anyway) because I was in a hurry to get to a meeting and didn't see the AMI ID. So I started it and headed to my meeting while it spun up. I knew the 10GB "C" drive partition Windows 2003 instances have wouldn't be big enough for Windows 2008 so I started there. I was pleasantly surprised to see a 30GB partition, however that's it. No "D" drive like with other instances (both Linux and Windows 2003 have a 340GB partition, at least on m1.small instances, larger instances have larger data drives.) Needless to say I was a little disappointed the 2008 instance didn't have an additional drive for data. Guess I'll just have to use EBS (Elastic Block Storage). Looks like the Windows 2008 instances are priced the same as the Windows 2003 instances, albeit a with a little disk space - probably have to squeeze a little more $$$ out of us to pay the mighty Microsoft. When you break it down it could cost you quite a bit more for Windows 2008 than 2003. Next I bundled the instance and shut it down. I used RightScale for the bundling because their interface is easy to use and does it all in one step. Now I have my own "customized" image to start from when I'm ready to work with Windows 2008 on Amazon EC2 in the future. Although Microsoft continues to expand PowerShell with more capability, the command prompt has not been left behind in Windows Server 2008. In fact, with this latest Windows Server release, the command prompt gains some capability, including a tool that allows administrators to add or remove features on a Windows Server 2008 installation with servermanagercmd.exe, which replicates some of the functionality from the Windows Server 2008 Server Manager. Through the use of various command line options, you can quickly and easily add or remove features and roles to or from your server. The command requires a parameter indicating the action that you wish to perform and, for some parameters, additional information such as which features you want to manage. The list below outlines some of the parameters available with servermanagercmd. -query: Output a list of the roles and features currently installed on your server. This command also shows you the roles and features that are available, but not yet installed. -install: Installs the roles or features that you specify on the command line. Add -allSubFeatures to the command line when using -install in order to add the supporting roles/features to a specified parent role/feature. As you are well aware some components require a server reboot in order to complete. To automate a server restart that takes place after the installation of a role/feature requiring a restart, use -restart. -remove: This is the opposite of the install command and removes the specified roles or features. The table below provides you with a complete list of the components installable using the servermanagercmd command. The first column is the overall feature name. For some features, roles, or services, there are multiple components available. The second column of the table gives you a complete list of all subcomponents while the third column is the identifier to use with the -install or -remove parameter.